Ben M on a 4 hour flight from Chamonix - Bionassy - Plaine Joux and back to Chamonix. This was the day after the hordes swarmed the summit of Mt. Blanc. Well we didn't nail the day when everyone either flew over Mt. Blanc or top-landed it, but we still got a great flight the following day. 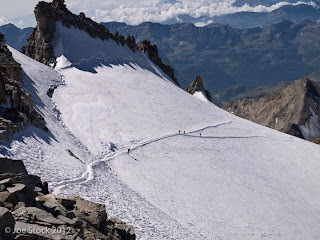 Ben M (BM) and I launched from a busy Plan Praz at around noon and got high over the Brevent before cruising over the valley to the Prarion and the Bionassy. After getting bumped around for long enough, we headed over to Plaine Joux where we caught lots of lift that let us make it back to Cham. 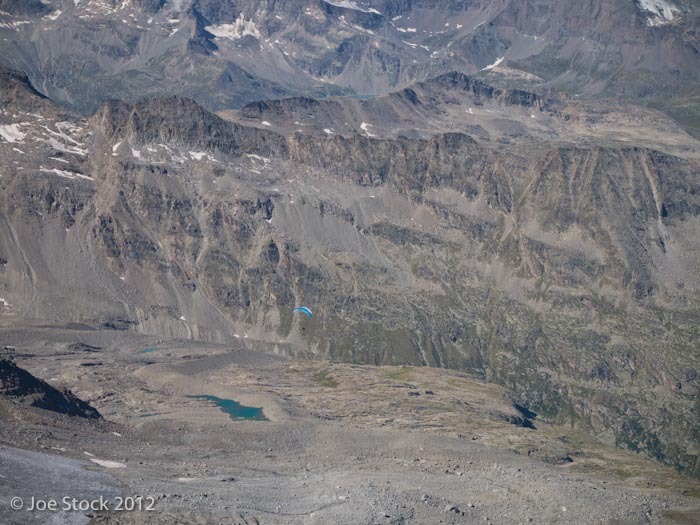 The flight was certainly a highlight for me and might have topped the Gran Paradiso flight from two days before! Cool view of the new Gouter Hut. The crazy thing about this photo is how many wings are deep in the clouds. Ben's Ozone Rush still looks good! Hanging with JOE STOCK! in the Gran Paradiso. Joe really loves early starts. Looking good on Italy's highest peak - The Gran Paradiso. The launch! Joe - professional photographer that he is - switched to video at this point and missed the action. No big deal. I'm sure we'll be back on the Paradiso again soon. Joe Stock Photo. Looking at Mt. Blanc from the Italian side. We had too many guides so I made myself scarce and launched from just below the summit rocks. 20 minutes later I landed 2000 meters below in the valley. 20 minutes. 2000 meters. Joe Stock Photo. 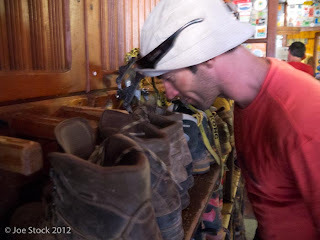 Sometimes the sniff test is the only way to tell whose boots are whose. Joe Stock Photo.